Banff - Blog from Banff, Alberta | Dreaming of a White Christmas! Today's forecast was for morning showers and afternoon storms so we decided to go to the gondola as soon as it looked clear enough. It is only a short distance up the road from our hotel. We got up there about 10am and it was a bit cloudy but ok. Our ride up was pretty clear. You can see for miles around the Rockies and down onto the town and surrounding lakes and rivers. It was spectacular. The building at the top was being renovated but the viewing platform and boardwalk were open. We could see rain clouds moving in quickly and part of a rainbow appeared. It was very pretty. There is a 1km walk -boardwalk & lots of steps - up to the weather station so I decided to walk up there. There was a cold wind blowing and it stated to rain but it wasn't too heavy. There were some patches of icy snow lying around beneath the trees. The fog started rolling in and by the time we got on the gondola to come back down it was pretty foggy up there. It wasn't so bad down below although it was raining. The gondola goes up Sulphur Mountain, named for the hot springs in the area. Right near the gondola there was a sign for the hot springs so we went up to have a look. All as we found was a pool full of people. The sign said the water was 39 degrees but there was no sign or smell of natural springs. The concierge at the hotel had given us some tips of things to do in Banff and one was visit Lake Minnewanka. It was only about 20mins away so we headed over there. It was absolutely beautiful. The water is so clear and green and it was surrounded by mountains. We were able to book on an hour's cruise. We found out the lake is the largest in the Rockies. It is about 1km wide and 28km long. The boat took us the entire length. The end of the lake is also the end of the Rockies. 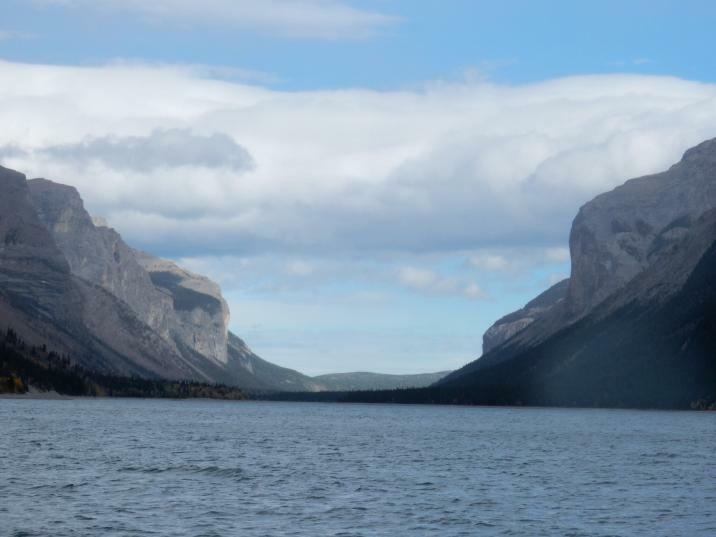 The gap between them is known as Devils Gate. This was our only glimpse of blue sky. The lake has been raised twice to build dams. It is 150m at it's deepest point. The second raising in 1941 completely submerged an old resort village called Minnewanka Landing which had been there since 1881. The lake is now a favourite place for scuba divers. After the cruise we went back into town. It was still busy even though it was raining. When we were looking around last night we came across an ice cream shop which boasted it has the best ice cream in the world so I had to try it!! It was delicious. We checked out a few of the shops we had walked past last night and I bought my Canadian souvenir which they are going to ship home for me. There was an Aussie girl working in the shop. There is a lot of Aussies working in a Banff. This hotel is full of them. We found a bar for an afternoon cocktail and then headed back to the hotel for dinner. Tomorrow is forecast to be a top of 9 degrees but fine.